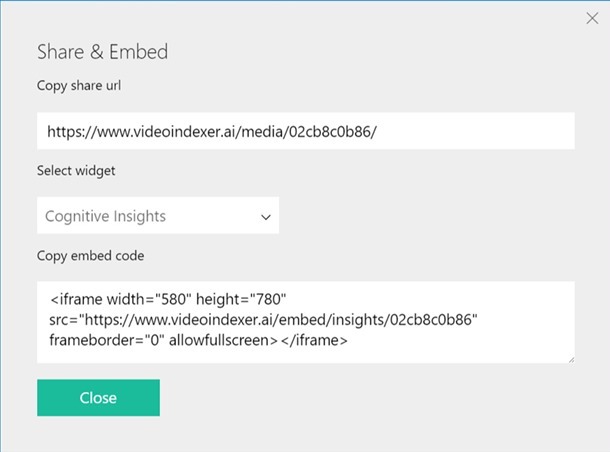 Video Indexer embeddable widgets is a great way to start adding AI insights to your videos. Whether you want to add deep search ability to your published videos or let your users be more engaged with the video content on your website, you can easily achieve that by using the embeddable option at Video Indexer web application or by using Video Indexer API. To get started embedding Video Indexer insights to your website you must have a registered account. If you don't have an account you can easily Sign-In to Video Indexer using a Microsoft, Google, LinkedIn, or Azure Active Directory and get one generated for you. Video Indexer supports embedding two types of widgets into your application: Cognitive Insights and Player. This widget contains all the visual insights that were extracted from the video after the indexing process such as people appearances, top keywords, sentiment analysis, transcript and search. In order to embed a widget in your website you need to get an embed code and paste it in your html file. The embed code contains iframe tag with embed URL. You have two options to get the embed URL: via Video Indexer web application or by calling Video Indexer API specific method. We will cover both ways. 3. After indexing process has completed click “play” on the video at the main gallery page. 5. Copy and paste the code into your html file. Notice: if you embed via the web application you can embed only public videos. Private videos requires accessToken parameter in the embed URL that contains 1h access token for the video. In order to get the embed URL that contains the accessToken for your video you can use Video Indexer API and call Get Insights Widget Url or Get Player Widget Url by passing the video id. If you manage your own videos you can also get the embed code based on your internal video id by calling Get Insight Widget By External Id. In order to start working with the API you will have to register and get your API subscription key first. The Getting started with the Video Indexer API blog post is where you will find a very detailed blog post about getting started with Video Indexer API. After you have your embed URL just paste it as “src” attribute of an iframe element which you want to locate anywhere in your website. If you want to provide editing insights capabilities (like we have in our web application) in your embedded widget, you will have to call Get Insights Widget Url or Get Insight Widget By External Id and add &allowEdit=true. Video Indexer widgets are customizable per your need. You can choose to embed only the insights widget or the player, or embed them both. The above file is required in order to handle cross origin communications between the widgets. You can read more about how it works at our docs. If you are using Azure Media Player in your website you can easily embed Video Indexer insights widget that will communicate with your player using vi communication plugin. Just paste the following script in your page after azure media player library script and you are all set. The plugin let you also get the VTT file for your player and choose if you want to sync between language and transcript with your video. For more information and code samples see the relevant Video Indexer docs. If you are using other players like YouTube player, Vimeo or your own player you can still embed Video Indexer cognitive insights and make them communicate with your player, for example jump into the relevant moment when user clicks on one of the widgets. Here is a detailed demo that demonstrates this approach. How to customize Video Indexer widgets? Video Indexer widget are customizable per your need. You can choose to embed only the insights that you think will be more valuable for your users. The possible values are: people, keywords, sentiments, transcript, search. The title of the iframe window can also be customized by providing &title to the iframe url. You can see a detailed demo here and read more at Video Indexer docs. If you embed Video Indexer player you can choose the size of the player by specifying the size of the iframe. By default Video Indexer player will have auto generated closed captions based on the transcript of the video that was extracted from the video with the source language that was selected when the video was uploaded. If you want to embed with a different language you can add &captions=< Language | ”all” | “false” > to the embed player URL or put “all” as the value if you want to have all available languages captions. The embed URL then will look like this : https://www.videoindexer.ai/embed/player/9a296c6ec3/?captions=italian. If you want to disable captions you can pass “false” as value for captions parameter. Auto play – by default the player will start playing the video. you can choose not to by passing &autoplay=false to the embed URL above. Here is a snippet for full widgets customization options. For more details, please take a look at the Video Indexer Documentation. Follow us on Twitter @Video_Indexer to get the latest news on the Video Indexer. If you have any questions or need help, contact us at visupport@microsoft.com.